"Papuan Gulf Skull Rack is among works in the Salgo Trust for Education gift to the University of Wyoming Art Museum. 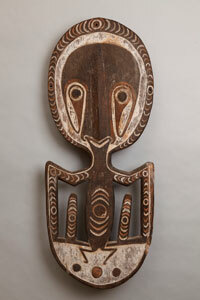 Tribal art gathered by three travelers -- United States Ambassador Nicholas M. Salgo; the artist, Neltje; and the educator, Mary Jane Edwards -- during their trips to Papua, New Guinea, will be featured in the University of Wyoming Art Museum exhibition, "Journeys Along the Sepik River: Tribal Art from Papua New Guinea." The exhibition opens Saturday, March 31. "Located in the southwest Pacific Ocean, Papua New Guinea today has a population of 7.5 million people representing more than 1,000 different tribal groups," exhibition curator Barbara Stone says. "Each has its own beliefs and each village has its own artistic style." The more than 80 objects in the exhibition are primarily from the regions of the Sepik and Maprik rivers, and include ancestral and mythological figures, masks, war shields, drums, canoe prows, skull racks and items of personal adornment. "Journeys Along the Sepik River" tells a story not only about these objects, their origin and their makers, but also about the people who journeyed there to acquire them. The exhibition is drawn, in part, from the recently gifted collection from the Salgo Trust for Education, originally acquired by the late Hungarian-American financier and diplomat, Nicolas M. Salgo, while on a trip to New Guinea with famed architect I.M. Pei in the early 1970s. "Expanding the exhibition are objects lent by Wyoming artist Neltje and the former head of the UW Art Department and executive director of Jentel, Mary Jane Edwards, who visited Papua New Guinea in 2006," says Susan Moldenhauer, art museum director and chief curator. "Together, we are able to consider the individual interests and expertise of these three unique travelers." Stone will be moderator on a panel about the exhibition Monday, July 23, 7 p.m., at the UW Art Museum. Neltje and Edwards will be among the panelists. This event is free and open to the public. For additional information about the UW Art Museum, call (307) 766-6622 or visit the museum's webpage at www.uwyo.edu/artmuseum or blog at www.uwartmuseum.blogspot.com. "Imagine learning from the masters" is a guiding principle of the UW Art Museum's programs. The museum is located in the Centennial Complex at 2111 Willett Drive in Laramie. Hours are Tuesday through Saturdays from 10 a.m.-5 p.m. and from 10 a.m.-9 p.m. Mondays. Admission is free.